Welcome to UWill Discover 2018! Encouraging Student Discovery in Research, Scholarship, and Creative Activity! Thank you to the undergraduate students who presented their research, scholarship, and creativity at the 2018 UWill Discover Conference! The 2018 conference included a record 100+ University of Windsor undergraduate student presentations, art installations, performances, and film productions over two days (March 22 and 23, 2018). The conference was an excellent opportunity for undergraduate students to highlight and showcase their discoveries and original work in their field of study, recognizing that discovery can take many forms and varies from field to field – research, business pitches, prototypes, film production, music and drama performance, compositions, educational tools, scholarship, etc. UWill Discover 2018 brought together students, faculty and staff across all university faculties and programs, along with regional business and community partners. Thank you to EPICentre, for being the official sponsor of the 2018 UWill Discover Closing Reception and Awards Ceremony. Thank you to the Faculty of Arts, Humanities, and Social Sciences for being the official sponsor of Thursday's keynote speaker, renowned author Nino Ricci. Thank you to the Faculty of Science for being the official sponsor of Friday's keynote speaker, Debbie Landers, Vice President of Cognitive Solutions, Blockchain & Industry Solutions, IBM Canada. A special thank you to Green Bean Cafe for donating coffee during the refreshment breaks both days. Grand Challenges: Students presented their work as it relates to one of the 4 Grand Challenges listed below. The University of Windsor has recast its strategic research priorities into four Grand Challenges: (1) Healthy Great Lakes; (2) Viable, Healthy and Safe Communities; (3) Sustainable Industry; and (4) Understanding Borders. These Grand Challenges are based on our geographical location and our historic research strengths. They collectively define us and tell the external world our aspirations and goals. No other Canadian university can tackle these challenges simultaneously today. *NOTE* We will contact award winners to coordinate receiving their award. A series of workshops were held prior to the 2018 UWill Discover Conference: (1) Enhancing your UWill Discover Experience: Developing your Online Professional Presence and ePortfolio, (2) Developing an Effective UWill Discover Presentation: Communication Strategies, and (3) Submitting to UWill Discover: Writing an Abstract, Original Work, or Artist Statement. Check back regularly for more information about workshops in preparation for the 2019 UWill Discover Conference. 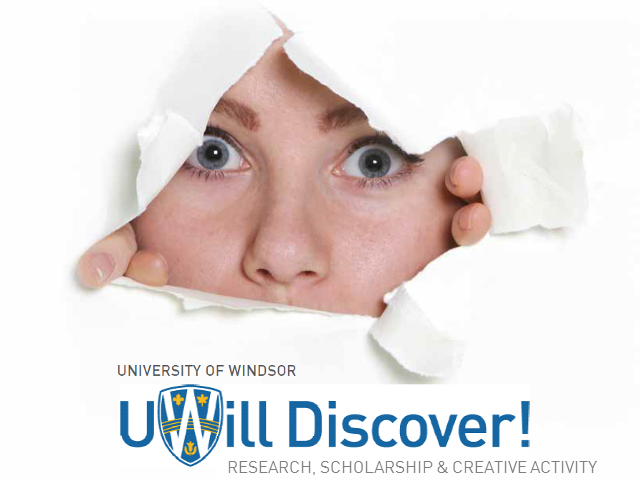 For access to information presented during the 2018 workshops, please contact the Conference Organizing Committee at uwilldiscover@uwindsor.ca.